Not my picture – thanks Wikipedia! After a long day of sightseeing in Kyoto, my family and I were back near our hotel and hungry. By this point in the trip, my mom and sister wanted a break from Japanese food. They saw a McDonalds in Kyoto station and were determined to get some familiar food. My dad reminded them that they could eat McDonalds in Canada, but they didn’t care. To compromise, my father and I dropped off my mother and sister at the golden arches and then set out to find some Japanese food. There are way too many restaurants in and around Kyoto station. After looking around for a while, we settled on a small small kaiten zushi restaurant. 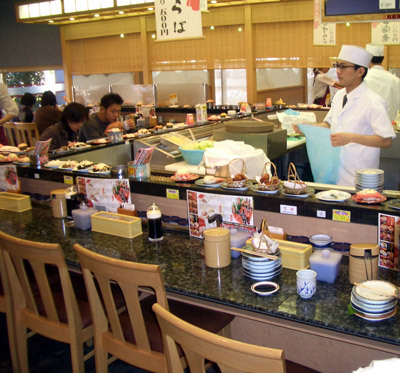 Kaiten zushi (the s in sushi becomes a “z” after kaiten) restaurants have a conveyor belt that moves plates of sushi through the restaurant. Smaller restaurants will have the chefs in the middle with sushi moving around them. Larger restaurants will have huge conveyors that wind their way through the restaurant. Our restaurant was relatively small, so we sat at the counter. We ordered beer, and were amused to find that our glasses were filled by an automatic beer pouring machine. The machine tilted the glass at an angle, and the spout moved along the inside of the glass to reduce the head. Near the top, the machine returned the glass to an upright position and added a tiny bit of foam to the top. The machine created a perfect pour every time, and was a lot of fun to watch. We had a few sips from our perfectly poured beers and then turned our attention to the conveyor belt and the tiny plates of sushi going by. Like other kaiten zushi restaurants, the plates were colour coded by price. My dad seemed confused, so I told him to just grab anything that looked good as it was going by. The problem was that he wasn’t very familiar with sushi, and didn’t know what was good. I selected a few pieces of the least threatening sushi as they passed our section of the counter. After a enjoying the first few pieces, he started to make his own selections, trying some familiar fish and some more adventurous choices. Several plates and another beer later, we were both pleasantly stuffed. After dinner we took a walk around the station building and surrounding area. Unlike major train stations in Tokyo, there wasn’t a lot going on around Kyoto station. We passed a number of small izakayas, and thanks to the window models I was able to instruct my dad on the difference between jocky (a regular size glass of beer), daijocky (a big glass of beer), and the rare but impressive super jocky (a really big glass of beer). Near the station we walked by a pachinko parlour. Like many foreigners, my dad was confused by the concept. I explained that gambling for money was illegal, but you could win a small prize and then sell it for cash at the nearby prize exchange. He sounded skeptical until we walked by the prize exchange window. When we had our fill of exploring, we returned to the hotel to find my mother and sister were happy with their McDonalds dinner, and that they had also done some minor exploring in the stores around the station. I am sure they had fun, but I really enjoyed the beer and sushi with my dad. When I was growing up, my dad was always interested in taking me to new places and teaching me new things. It was great to get the opportunity to return the favour. This entry was posted on July 29, 2014, 6:08 pm and is filed under Visitors, Western Japan. You can follow any responses to this entry through RSS 2.0. You can leave a response, or trackback from your own site.